Also refered to as Pasilla and Ancho, depending on the region. 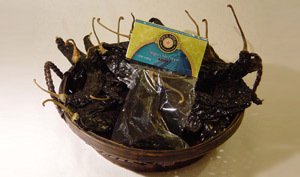 This long, dark beauty has a mildly rich taste that gives Mole its wonderfully unique taste. Delicious in sauces. Add a dash to soups and stews. 2-4 Heat Rating.